Brian Calley, 10198 Butler Rd. Portland, Ml 48875, REP.
Patrick Colbeck, 2843 E. Grand River #262, East Lansing, Michigan 48823, REP.
Jim Hines, PO Box 5595, Saginaw, Michigan 48603	REP.
Bill Schuette, PO Box 12307, Lansing, Michigan 48901, REP.
Gretchen Whitmer, 1456 Meadowbrook, East Lansing, MI 48823, DEM. Abdul El-Sayed, PO Box 23180, Detroit Michigan 48232, DEM. Shri Thanedar, 2479 Woodview Lane, Ann Arbor, Ml 48108, DEM. Bill Gelineau, PO Box 120064, Grand Rapids, Michigan 49528, LIB. John J. Tatar, PO Box 510104, Livonia, Ml 48151,LIB. John James, PO Box 27363, Lansing, Michigan 48909, REP.
Sandy Pensler, PO Box 11086, Lansing, Michigan 48901, REP.
Debbie Stabenow, PO Box 4945, East Lansing, Ml 48826, DEM. Travis Wines, 11566 E. Goodall Rd., Durand, Michigan 48429, REP.
Daniel T. Kildee, P.O. Box 248, Flint, Michigan 48501, DEM. Kevin Daley, 3387 Daley Rd., Lum, Ml 49412, REP.
Gary Glenn, PO Box 1 1 7, Auburn, Michigan 48611, REP.
Joni Batterbee, 4891 Holmes Rd., Goodrich, Ml 48438, DEM. Cynthia A. Luczak, 3126 Gaslight Drive, Bay City, Michigan 48706, DEM. Chuck Stadier, 4640 Sheridan Road, Vassar, Ml 48768, DEM. REP. Brian K. Elder, 913 Fifth Street (48708), PO Box 66, Bay City, Ml (48707)	DEM. Jason Gower, 1187 Sarah Jane, Auburn, MI 48611	REP.
William E. Schumacher, 405 E. Munger Rd., Munger, Ml 48747, REP.
Mike Harpham, 4358 11 Mile Rd., Bay City, Michigan 48708, DEM. Jacob Hilliker, 1507 S. VanBuren street, Bay City, Michigan 48708, DEM. 1 st DIST. COUNTY COMMISSIONER (2 year term), DEM. Kevin E. Burke, 1924 E. Prevo Road, Linwood, MI 48634	REP.
4th DIST. 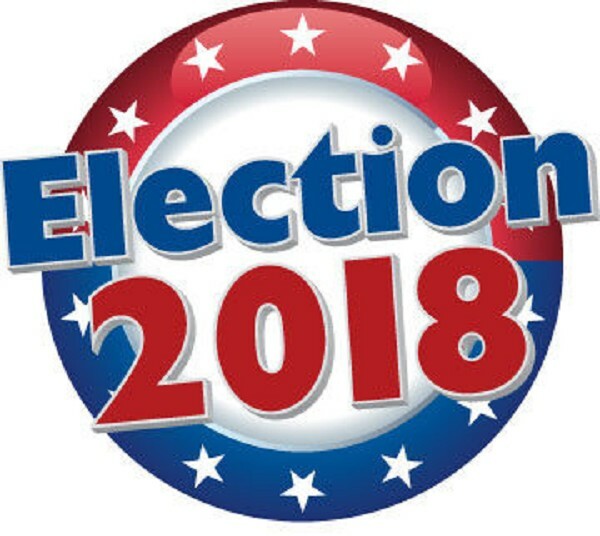 COUNTY COMMISSIONER (2 year term), REP.
Vaughn J. Begick, 5353 Lorraine Court, Bay City, MI, REP.
Joe Johnson, 7343 Brandon Drive, Bay City, MI 48706, REP.
Michael E. Lutz, 1704 Borton Avenue, Essexville, Ml 48732, DEM. Terri Close, 1083 Arms Road, Essexville, Ml 48732	DEM. HAMPTON TOWNSHIP TRUSTEE-Partial Term End 11/20/2020	DEM. Debra Friebe, 387 W. Salzburg Road, Auburn, MI 48611	DEM. Shall the City of Auburn impose an increase in an amount not to exceed 2.0 mills ($2.00 on each $1 ,000.00 of taxable value) in the total tax rate limitation on all real and personal property within the City and levy it for a period of six years, 2018 through 2023 inclusive, for all fire protection personnel expenses which will raise an estimated $101,910.00 in the first year the millage is levied? Shall the total tax rate limitation on real and personal property within Bangor Township be increased by 2 mills ($2.00 per $1 ,000.00 of taxable value) for a period of six (6) years, 2018 to 2023 inclusive, dedicated for Bangor Township fire service operations to include staffing, equipment or any other lawful fire service purpose, which, if levied, will raise an estimated $796,887.06 in the first year of such levy? Shall the tax limitation on all taxable property within the Township of Garfield, Bay County, Michigan, be increased and the Township be authorized to levy a millage in an amount not to exceed 1.4385 ($1.4385 on each $1,000 of taxable value), of which .9385 mill is a renewal of the millage rate that expires in 2018 and .50 mill is new additional millage, for four (4) years, 2019 to 2022 inclusive, to provide funds for operating, maintaining and purchasing for fire department or any other purpose authorized by law for fire service purposes? The estimate of the revenue the Township will collect in the first year of the levy (2019) if the millage is approved is approximately $65,000. Shall the tax limitation on all taxable property within the Township of Garfield, Bay County, Michigan, be increased and the Township be authorized to levy a millage in an amount not to exceed .7191 mill ($.7191 on each $1,000 of taxable value), of which .4691 mill is a renewal of the millage rate that expires in 2018 and .25 mill is new additional millage, for four (4) years, 2019 to 2022 inclusive, to provide funds for purchasing firefighting equipment for the fire department? The estimate of the revenue the Township will collect in the first year of levy (2019) if the millage is approved is approximately $33,000. Shall Portsmouth Charter Township continue to levy up to 1.5 mills ($1.50 per $1,000 of taxable value) above the tax limitation imposed under Article IX, Section 6, of the Michigan Constitution, and levy it for 5 years, December 1, 2019, through December 1, 2023, inclusive for the purpose of raising revenues for the maintenance and improvement of public roads in Portsmouth Township, raising an estimated $135,000 in the first year the millage is levied.